What countries offer the best growth opportunities? How has consolidation played a role in the industry over the past year? How will architectural paint demand grow by product, market, formulation, and end user? As a preview, India is expected to post the most rapid gains of any major national market through 2022. The pace Freedonia expects to see India grow is advancing at a robust pace, even overtaking China as the fastest growing national market. 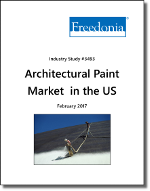 Freedonia forecasts that sales for architectural paint in India will be nearly on par with those of the US by 2022. This allows significant opportunity for expansion and innovation. Acquisition has been - and will remain - a key expansion strategy in the world's architectural paint industry. This is in part due to the localization of the industry in a given region. Read on to learn how this strategy affects emerging markets.